Skiing in this region dates back to sometime before 1890 when Ole Sandberg used a pair of home made skis to descend from his mine to the railway station at Albert Canyon. Sandberg and other Scandinavian immigrants brought skiing to the community both as a sport and as part of their work. Ole Westerberg, for one, used skis to deliver mail 80 kilometres north of Revelstoke, a job he kept for 35 years. Along his mail route he also delivered supplies, ran a trap line, and had misadventures with grizzly bears and thin ice. Revelstoke merchant F. B. Wells was the first to retail skis and alsohelped established the Revelstoke Ski Club in 1891 (the oldest continually operating ski club in Canada). Travel by means of “Norwegian snowshoes,” as skis were initially known, quickly caught on in Revelstoke, a community with one of the highest annual snowfalls in the world. 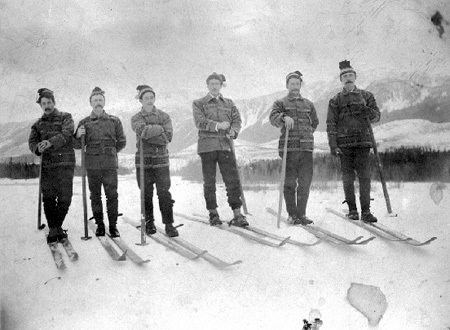 Photo: Revelstoke Ski Club 1893 (note matching jackets) – Photo courtesy of B.C. Archives #B000764. The late 19th century saw a growth of interest in skiing which spread from Norway to central Europe and North America. Ski jumping became a specialized branch of cross country races, which had included leaps from terrain features. 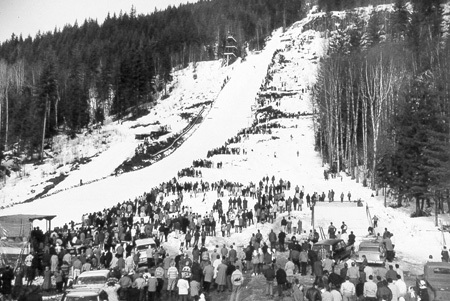 The Revelstoke Ski Club first organized cross-country races and ski jumping events on Mount Revelstoke in 1915, attracting international competitors for the next six decades. In the years prior to the opening of the Trans Canada Highway in 1962, winter access to Revelstoke was only by train. To help accommodate the influx of thousands of visitors to Revelstoke during competitions, extra passenger railcars were left on a siding during the competition as a place for visitors to sleep. The Mount Revelstoke site, still visible from downtown Revelstoke, was the last of series of jumps built in this area. It was the largest natural ski jump in Canada, and the only site in Canada where world records were ever set. The slope had an ideal shape, requiring little in the way of alteration. The site needed no artificial tower for the jumpers’ approach, and the run-out followed a natural contour. The combination of conditions here made record jumps possible, which is what attracted jumpers and spectators. Photo: Mount Revelstoke Ski Jump 1950’s – Photo courtesy Revelstoke Museum and Archives. Flying off the Mount Revelstoke jump in 1916, Nels Nelsen, a Norwegian immigrant to Revelstoke, set a new world record of 186 feet. He held the Canadian record until 1932, breaking his own record five times and setting world records here again in 1921 and 1925. Nelsen intended to work his way to Europe on a freighter to participate in the 1928 winter Olympics, but team organizers in Britain declined to include him on the Canadian team. More concerned with appearances than performance, they considered his style of travel unbecoming of a gentleman. His ski career ended in 1932 after he lost a hand in an accident with a rifle. Bob Lynburne did make it to the 1932 Olympics in Lake Placid. Back in Revelstoke the following year he established a world record with a 287 foot jump. A brain injury suffered on a crash landing ended his ski career. He continued to work for the railway but was never quite the same. He had the habit of long walks in the woods and one day he did not return. His body was never found. Isabel (Pat) Coursier set the world record for women on the Mount Revelstoke jump in 1923 and was the only woman that year to compete unassisted. Other “glider girls,” as they were known, went off the jump holding hands with a male partner. Coursier went on to competitions across North America, often breaking new ground for women’s competitive sport. Her record remained uncontested until her retirement from jumping in 1929. She studied physical education at McGill University and worked as a teacher in Canada and Scotland, returning in her retirement to Revelstoke and later to Penticton. John McInnes, North American ski jumping champion in 1969, also competed in the Olympics. He continues to operate a business in Revelstoke. His brother Alan McInnes, also a jumper at the time, would take three weeks off work prior to a competition to prepare the jump. The entire slope of snow was first broken with a shovel, boot packed, and then smoothed with skis. Later, a system employing a heavy roller, raised and lowered by a winch, was used for finishing the surface. The last improvements to the facilities on Mount Revelstoke were made in the early 1960s, which included the judges’ tower that still stands. Lift serviced skiing moved in 1969 from Mount Revelstoke to nearby Mount Mackenzie with the intention of someday expanding to the summit. The last jumping event took place in 1974. The advent of the large constructed jumps nearer to urban centers supplanted to need to travel to remote natural jump sites like Revelstoke. Also, Revelstoke’s heavy snowfalls required a great deal of manual packing—a volunteer workload that was difficult to sustain. Today, the Revelstoke Ski Club continues as an alpine ski racing program. Over the years several local racers have competed internationally. Cross country skiers split from the parent club to form the Revelstoke Nordic Ski Club in 1989 when the group purchased a track setting machine. 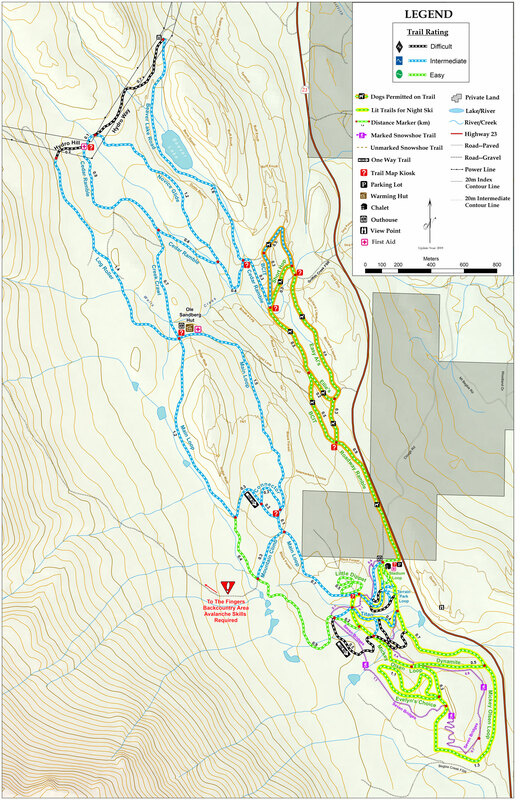 The Nordic skiers operate a network of ski trails on Mount Macpherson under an agreement with the British Columbia Forest Service.